More and more people have diabetes, a disease with increased sugar levels in the blood and rest of the body. Over time sugar (glucose) also sticks permanently to many proteins in the body. This permanent sticking of glucose (=glycation) results in Advanced Glycation Endproducts (AGEs). AGEs impair the normal function of these proteins. This happens also in the wall of small and large blood vessels, and results in impaired function and damage of these blood vessels. The AGE measurement on your arm assesses how many AGEs are present just below the surface of your skin. If the level of AGEs in the skin is high, this is also the case in the blood vessel wall, and thus the risk of blood vessel problems is higher. A number of types of AGEs react on UV light (fluorescence). 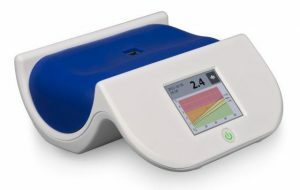 The AGE Reader is able to measure the fluorescence in your skin and calculate the quantity of AGEs. The measurement takes less than a minute, is completely non-invasive and without any risk.